When I read the Tao Te Ching in my freshman year of high school I didn’t really get it. The principle texts of Taoism were just a little bit too… vague for my high school self. All of the talk about going with the flow, and the impermanence of the universe was just too much for me at the time. I just couldn’t dig it. That is until I started playing Minecraft. 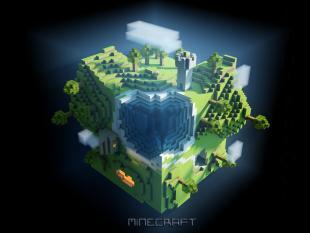 Minecraft is an open-ended sandbox building computer game built by Markus Persson. In game, players are put in an infinitely large and randomly generated world where they can create and destroy at will. Resources are gained by “mining” the natural environment; for example, mining a block of stone yields a block cobblestone that can be placed anywhere. In the world of Minecraft the possibilities are pretty close to limitless. I had been playing Minecraft for a few weeks, and had created what I thought was a masterpiece (here’s a genuine masterpiece [not created by me] for reference). My house built atop a massive tree seemed perfect – until my brother suggested I build a fireplace to keep my cuboid avatar warm. I realized that was just what my house had been missing. I grabbed my flint and steel, cast a tentative spark, and proceeded to burn my entire house down. My hours of painstakingly climbing in the sky to construct my castle was burning before my eyes. The ashy pixels floating upwards a taunting reminder of my bone-headedness. I force-quit the game, hoping it wouldn’t be saved, but I was too late. And that’s when I came to a realization. I booted up Minecraft and started a brand new randomly generated world. None of my accomplishments had transferred–nothing to indicate my previous dominion. And that’s what I loved. The fun of the game came from gathering resources and creating my house, not living in it. The beauty was in the journey, not the destination. Varying ways? Heaven and earth springing from the concept of Nameless-ness? It sounds to me like Lao Tzu is talking about randomness. Worlds that are always uncertain in their construction, and an open-ended play style with no clear goal. The connections started becoming clear to me – The Tao Te Ching, Minecraft, even my literature class – they were all about learning to value the process of learning, and not just the outcome. School and Minecraft are connected by one valuable thread for me: Learning how to thrive, and identify the tools necessary for success, are the concrete skills of the 21st century. I’m proud that I have developed the “learning to learn” skills that I hope will help me thrive in college and in the workplace. The resonant message for me is that building, exploring and learning about the world is both more enjoyable and meaningful than merely inhabiting that world. I love that “puzzle-piece-fitting-into-place” feeling, and it’s addictive. I’ve had that feeling this summer as I learn more about how adult learning fits into the workplace, and I wish more companies took that approach to professional learning: Provide the content (available here on OpenSesame! ), provide the connections, and provide the time and place to learn. Build a world, like Minecraft, where employees can construct, connect and explore – and watch them become empowered, inspired learners, just as I was in my cuboid world.